To help you get the most out of our site, we’ve assembled this concise guide to the information and assistance available through the HUD USER website. The HUD USER website is supported and managed by U.S. Department of Housing and Urban Development’s Office of Policy Development and Research (PD&R). HUD USER hosts research, publications, periodicals, data sets, a Bibliographic Database, the Regulatory Barriers Clearinghouse (RBC), and more. Learn more about PD&R and its functions. View our informational video to learn more about the resources available on HUD User. Looking for information regarding public housing programs, such as housing choice vouchers? You can find it through HUD’s Office of Public and Indian Housing Office by clicking here. Do you need to find specific HUD forms? Please click here. Looking to learn more about local housing assistance and contact information for local housing authorities? Please click here. Information about all HUD programs not affiliated with the Office of Policy Development and Research can be found at HUD’s main website. HUD USER’s Research Finder lists available printed and electronic copies of published HUD research. Primarily sponsored by HUD's PD&R, these reports, executive summaries, case studies, and guidebooks span the fields of housing and urban development and are usually available as free downloads. Most reports can also be ordered in hard copy from the HUD USER Web Store. HUD USER provides interested researchers with access to original data sets generated by PD&R-sponsored data collection efforts, including the American Housing Survey, HUD Median Family Income Limits, Fair Market Rents, and Low-Income Housing Tax Credit Data. This data is provided in various formats, including PDF, Excel, Word, dBase, ASCII, and SAS. To learn more about all of the data sets available on HUD USER, please click here. The USHMC web portal contains all the national, regional, state, metropolitan, and local data and analysis in one location. You may search by geography to obtain all the reports available for a particular area. Alternatively, you may search by the type of report. Each report contains different levels of data and/or analysis. Learn more. Unique data displays available on HUD USER include GIS Maps and Infographics. 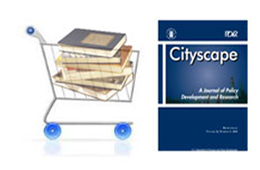 Cityscape is PD&R’s journal of policy development and research. Evidence Matters is a quarterly print periodical from PD&R, also available online. Edge, an online magazine, provides easily understood translations of PD&R and HUD partners' research, a message from PD&R Senior staff, and a wide range of information on housing and community development issues, regulations, and case studies. The Bibliographic Database on HUD USER is the only bibliographic database exclusively dedicated to housing and community development issues. It contains more than 11,000 annotated citations to research reports, articles, books, monographs, and data sources in housing policy, building technology, economic development, urban planning, and a host of related fields. HUD USER maintains three electronic mailing lists to keep constituents informed of new housing research publication releases, as well as case studies and events of interest to the housing community. The mailing lists provide a means of receiving updates on new research and resources available from PD&R and exchanging information regarding specific data sets. All of our subscription services are free. For more information about the newsletters and how to subscribe, please click here. The Regulatory Barriers Clearinghouse (RBC) collects and disseminates information on the creation and maintenance of affordable housing, as well as strategies and resources for building sustainable affordable housing. IPAD provides expert resources and a venue for staff and partners to access the best available evidence, innovations, and lessons from the philan-thropic and international housing sectors. Learn more about IPAD here. The HUD Secretary recognizes achievements in housing and urban development through annual awards. The categories include Housing and Community Design Awards, the Award for Excellence in Historic Preservation, the Opportunity and Empowerment Award, and the Best in American Living Award. To find out more about each of these awards, please click here. HUD USER offers some of our most popular housing research in eBook-friendly formats. Sign up for instant notification of new releases via our eBook-specific RSS feed, browse the current selection, and download titles of interest. Visit the eBookstore here. The HUD USER Web Store makes more than 800 housing-related titles available for online ordering. The Web Store is searchable by keywords or phrases, and titles are arranged topically for easy browsing. Click here to go to the HUD USER Web Store.